Here is a convenient way to mark or re-mark the note names on your rosewood xylophone bars to make them easier to see. All you need are gold and silver gel pens! 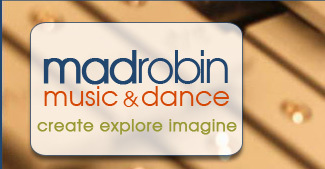 There are many different brands of classroom xylophones, and many classrooms have a combination of brands manufactured over several decades. Some of these brands originally had the note names marked in gold, silver, white or yellow, while other brands had the note names stamped into the wood, but not colorized. Here is an example of where I've taken a set of Golden Bridge xylophone bars and used a "Gelly Roll" brand gold gel pen to make the note names stand out more clearly. I recommend working slowly, holding the gel pen as vertically as possible and moving at a constant speed. The ink will flow out and fill the depression where the note name is stamped. If you make a mistake, it is easy to remove the ink you've just applied by using a drop of furniture polish, wiping it all off and starting over. Once you are finished, allow the gel pen ink to dry overnight, or for at least an hour before playing or touching the instrument. If you are planning to polish the bars, do it before your re-mark the note names, and be sure to wipe off any excess furniture polish before using the gel pen. 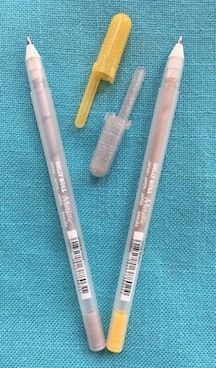 For older Studio 49 and for Studio 49 Series 2000 use the silver gel pen, as these bars were originally colored white or silver. For newer Studio 49 Series 1600 and 1000, use the gold gel pen, as these bars were originally colored yellow or gold. 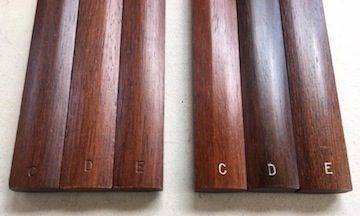 With Studio 49, the note name color is diagnostic of the type of rosewood and the tuning method employed, so it is good to keep that consistent. 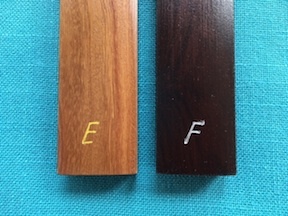 Here is a photo showing a Series 1600/1000 "E" bar, next to a Series 2000 "F" bar.